Our patients are important to us, which is why we use the latest technology in our practice. As technology advances we are able to provide excellent care for our patients and give them great results. We are able to have a more in-depth analysis which allows us to provide more accurate information and treatments. Digital x-rays are on the rise, becoming more standard, and it doesn’t take long to understand why. 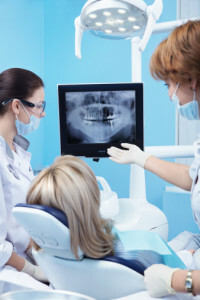 With digital x-rays, dentists are able to load them into an imaging program where they can make detailed analysis of the teeth and surrounding structures. This is what makes their informed decisions accurate. Also, digital x-rays let off 80% less radiation than standard x-rays as they were designed with the patient’s benefits in mind. We also have great diagnostic tools like the Intraoral Camera and the diagnodent that we use to detect dental problems. One of the benefits of the Intraoral Camera is that it is able to look at different angles in the mouth. In fact, a few years ago we wouldn’t have even been able to do this! The images of your entire mouth is placed on a monitor where your dentist can view at a closer look and see if there are any problems hiding or missed. The cool thing is you get to see the monitor too so you can get a better understanding of what’s going on and why you need certain treatments. The Diagnodent is an extremely helpful technology that comes with great benefits. It’s a fluorescent laser that is used to find cavities that have not reached the surface of your tooth yet. How cool is that? Sometimes x-rays and other diagnostic methods can miss these types of cavities and they are not caught until the decay has advanced. This way you can catch cavities before it decays even further.